These are the words of him who holds the seven stars in his right hand and walks among the seven golden lampstands: 2 I know your deeds, your hard work and your perseverance. I know that you cannot tolerate wicked men, that you have tested those who claim to be apostles but are not, and have found them false. 3 You have persevered and have endured hardships for my name, and have not grown weary. 4 Yet I hold this against you: You have forsaken your first love. 5 Remember the height from which you have fallen! Repent and do the things you did at first. If you do not repent, I will come to you and remove your lampstand from its place. 6 But you have this in your favor: You hate the practices of the Nicolaitans, which I also hate. I DO want to work hard and persevere and not grow weary: I have a tendency toward laziness. By nature I am a procrastinator. I have to work hard at not being lazy and procrastinating. The things I am passionate about I work hard at. The things I am not so passionate about I tend to put off. In our country it is pretty easy to get by with being a lazy Christian – I often wonder what my faith would be like if I had to grow up in a country like Haiti. I have much respect for Pastors Leon and Luke and the other fervent believers there. I DO NOT want to forsake my first love: I want Christ to be pre-eminent in my life. There are a lot of things that vie for pre-eminence. It is only through staying in the Word and staying connected to faithful believing friends that I even come close to not forsaking my first love. I DO want to hear what the Spirit says: I want my ear attuned to the Spirit’s voice. I want to be able to discern his voice in the midst of the other voices that clamor for my attention. I know that this will take the spiritual discipline of listening. I need to make sure that I have quiet times where I do nothing but tune my ear into the Spirit’s frequency, keep still and just listen. I DO want to be an overcomer: I have always loved this word in Scripture and I love all the promises to believers in Revelation 2-3 about overcoming – even if I don’t understand them all. 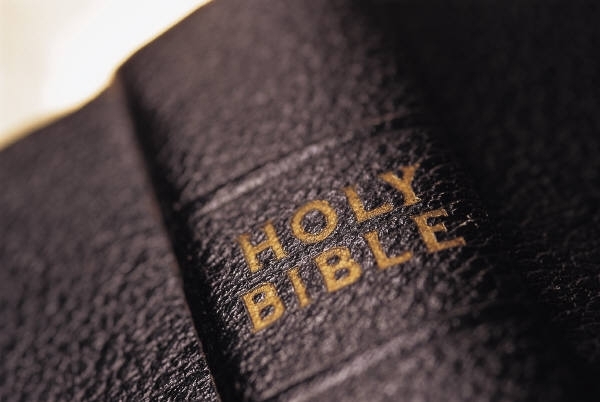 The word overcomer comes from the Greek word “nikeo” – or you might recognize it as Nike. It means to gain the victory. I know that there are going to be obstacles and challenges along the way. I want to keep focused on the goal so that the obstacles don’t cloud my vision of why I keep on keeping on. I DO want to eat from the tree of life in the paradise of God: I can only imagine what it would have been like to be in the original Garden with God at the beginning. The promise here is that I will get to find out. So, as in so many of the other passages that we have looked at this year, once again we see that the promise of our future hope gives powerful motivation to persevere in the present. So whatever you may be going through this week, take heart! We have a lot to look forward to. 14 For Christ’s love compels us, because we are convinced that one died for all, and therefore all died. 15And he died for all, that those who live should no longer live for themselves but for him who died for them and was raised again. 16 So from now on we regard no one from a worldly point of view. Though we once regarded Christ in this way, we do so no longer. 17 Therefore, if anyone is in Christ, he is a new creation; the old has gone, the new has come! 18 All this is from God, who reconciled us to himself through Christ and gave us the ministry of reconciliation: 19 that God was reconciling the world to himself in Christ, not counting men’s sins against them. And he has committed to us the message of reconciliation. 20 We are therefore Christ’s ambassadors, as though God were making his appeal through us. We implore you on Christ’s behalf: Be reconciled to God. 21 God made him who had no sin to be sin for us, so that in him we might become the righteousness of God. This very well could be my favorite passage in all of the Bible. There is so much packed into these verses. It was very hard to pick one verse to focus on as a memory verse because they are ALL memory verse worthy. You might want to give a shot. I think I’ll do something a little different this week. I’m going to take each verse and turn it into a prayer that reflects my pondering. Feel free to listen in as I talk with God. I have continued to enjoy the pondering comments that you leave. One suggestion for those of you who post your comments on Facebook – instead go directly to the blog post and leave your comments there so that others can see them as well when they visit the blog. This Week’s Passage and Memory Verse (in red): 1 Since, then, you have been raised with Christ, set your hearts on things above, where Christ is seated at the right hand of God. 2 Set your minds on things above, not on earthly things. 3 For you died, and your life is now hidden with Christ in God. 4 When Christ, who is your life, appears, then you also will appear with him in glory. So here’s the questions I’ve been thinking about this week: What’s the difference between “setting you heart on things above” and “setting your mind on things above”? And then, how do you set your heart and mind on things above in practice? So all this to say that this is why this pondering thing is so necessary and so beneficial for me – and hopefully for you. And why Scripture memory is such a great discipline to be in the habit of doing. Both of these help me to set my heart on things above and to set my mind on things above – thus fueling my desire for God and drawing me into closer relationship with Him. So thanks for pondering with me and for motivating me to do this week in and week out – even when I don’t feel like it sometimes. And I promise you I do have those times. Don’t be so shocked… you do too! 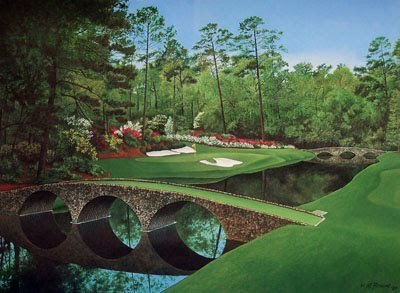 I mentioned in my “Memories of the Masters” post that Amen Corner is a metaphor for my life. Let me explain. Let me start at #1. Standing on the first tee. Not knowing what to expect. I am full of hope that this could be one of the greatest rounds of my life. Such a thrill to even be able to stand there. But also very scary. Knowing that this is where the greats of golf have stood. Having seen for myself the pitfalls that lie ahead. Having seen people conquer the course and and be counted among the legends of Master’s history and having seen shipwrecks take place – also taking their place in Master’s history. What will this round hold for me? What will this life hold for me? I choose to play! Just like I choose to live and try to conquer all the ups and downs of life. Expecting that life will at times be painful, but also enjoying the indescribable thrill of playing the game and waiting for that one shot, that one moment, that will energize me and keep me going. I endure the mundane so that I can enjoy the magnificent! First, hole #11. One of the hardest holes on the course. It demands that you start well if you want to finish well. It calls for courage and finesse and creativity. This is where Larry Mize broke Greg Norman’s heart in 1987 with an improbably 140 foot chip in from off the green to win the green jacket (which incidentally, Jack Nicklaus, as the ’86 champion helped him slip on). The thrill of victory. The agony of the defeat. 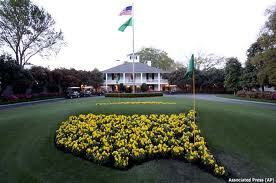 It is said that The Masters does not really even begin until the back nine of Sunday’s round. You have to survive 10, 11, and 12 to get to the 13, 14, and 15. Life. Sometimes it is about surviving. And at times when we are just trying to stay alive… we thrive. I have found that it is often when I am in survival mode that God teaches me the most. He sharpens me. He shapes me. He prepares me to deal with the tough times of life and equips me to handle with humility the good times of life. But sometimes in life when things are tough… they just get tougher. 1) The target is small and runs from east to west not north to south – which means that I must choose the right club if I have any chance of getting it on the green. 2) The swirling winds – The wind might be doing one thing on the tee box, but something completely different on the green. You just never know – and it could change between the time you hit the ball and the time that it lands back on planet earth. You just never know. 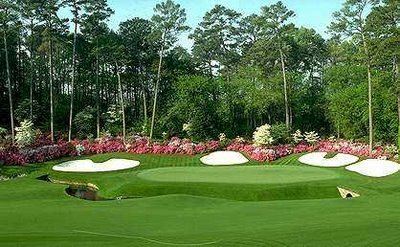 3) The crowds that are watching – everyone knows that if you are in the hunt on Sunday at the Masters that this little hole could very well define who wins and who loses. Everyone is watching. Everyone is holding their breath. Everyone is waiting to see how you will determine your destiny. You may not win the tournament on this one hole – but you could very well lose it. 4) The emotions created by the drama of the moment – I can only imagine how nervous I would be. Golf is a head game. You have to be able to control your emotions. You can’t think too much. You have to trust your swing and your game what “brung you” to this point. A little history. In 1980 this is where Tom Weiskopf put 5 balls in the water and made a 13 in the first round. In 1992 this is where Fred Couples made a miraculous par after his ball semi-plugged into the bank above Rae’s Creek. This is where Tom Watson double bogeyed in 1991 costing him the tournament and losing to Ian Woosnam. In 1997, Tiger Woods came to the hole with a ten-shot cushion. Despite his commanding lead, Woods couldn’t help but smile and then exhale once his tee shot found the green. It is thrilling… yet scary! Beautiful… yet intimidating! Daunting… yet dangerous! But this is life. It is thrilling. But it can be hard. It is scary but it can be fun. It is beautiful but it can turn ugly. But it is times like this when I feel most alive. It is times like this when memories are being made, when stories are being written. Mark Batterson said in one of his books a quote I have never forgotten, “We ought to live the kind of life that is worth telling stories about.” I like that. I like that a lot! It is a hole where you can come away with eagle. but it is just as easy to come away with double bogey. It is a startlingly beautiful hole. The hundreds of azalea bushes providing a gorgeous backdrop to the perils that lurk just one shot away. Last year this is where Phil Mickelson took control of the tournament with his bold 2nd shot out of the pine straw, under the trees, over the creek, onto the green. It was a ridiculously amazing shot that captured in one moment what this hole is all about. Risk and Reward! In 1985, Curtis Strange came to #13 with a 3 stroke lead, went for the green with a 4-wood, hit into Rae’s Creek and wound up making bogey on his way to a back-nine collapse. He never won The Masters. Risk and Reward! But isn’t that what makes life worth living. You can sit in the stands or you can play the game. If you choose to sit you can expect to experience life vicariously. But if you choose to play you can expect ups and downs, thrills and disappointments, joy and pain. But at the very least you will have some great stories to tell along the way. So this is one reason why I so very much look forward to The Masters every year. For me, it is great metaphor for life. And it reminds me why the game of golf is such a great game – but even more importantly, why God created me to live a life of purposeful adventure. Jack Nicklaus – I was a huge Nicklaus fan growing up. I would follow him around the course – and because I was young, fast, and knew my way around I could always finagle a good spot to watch him – even though he had the largest crowds. 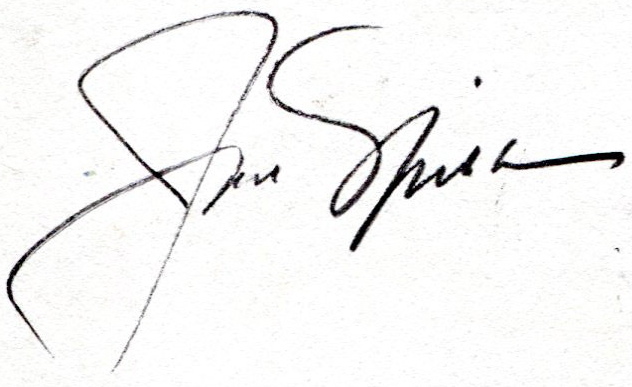 As a kid I was an autograph hound and managed to get his autograph 3 times. Ben Crenshaw’s autograph – In 1972, Ben was playing in his first Masters. No one knew who this young kid was. I saw him standing by himself next to #1 – it appeared that he was almost in awe of the fact that he was there. I walked up and asked for his autograph. He would go on to win the tourney 2 times during his career and often credits me and the encouragement I gave him that day for his success. Tiger – I’ve also been a huge fan of Tiger, the golfer. I’ve always enjoyed watching his excellence and finesse on the course. In the last 15 years I’ve followed him a lot. I was there for the Friday round when he won for the first time in 1997. Ham sandwiches – Never been a big ham eater but Augusta National had the BEST ham sandwiches. 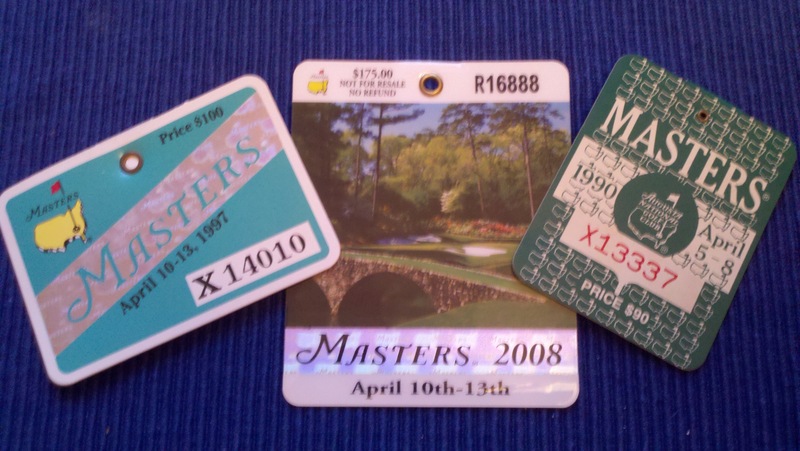 And you would be surprised to know that the food at The Master’s is priced very fairly – unlike other sporting events where you pay $10 for a sandwich and drink. The pristine environment – Absolutely gorgeous! If you’ve ever watched The Master’s on TV then you know it is a pretty place. But I promise you that even HD TV cannot do justice to how spectacular it really is. And you will never see a speck of trash anywhere. And rumor has it that they even make sure the pine straw all lays in the same direction. Incredible attention to detail. Taking my sons and friends – Because of the generosity of my cousin I have been able to take quite a few folks to see the tournament. In case you are not aware it is a very difficult ticket to get. It borders on a high and holy privilege to be able to go to The Masters. Scott has been able to go three times so far and Tucker once; and then a bunch of my buddies. I will single out one memory. A college chum of mine, Andre Hawkins, went with me when we were at Tulane. He idolized Jack Nicklaus and loved The Masters. I remember standing beside #1 with him when Jack was on the first tee and he literally broke into goose bumps because he was so excited. That’s kind of the effect this great tournament has it’s patrons. The roars of the crowd – You really have to be there to experience the electricity of the place – especially when it goes from being soooo quiet (again, hard to explain how quiet a crowd of 10,000 can be) to so loud when the crowd reacts to a great shot. There is a buzz that reverberates around the whole course in seconds and everyone is scoreboard watching to see what just happened. The Greatness of the Greats – I’ve been able to see all the greats of the previous generations play the game of golf – Sarazen, Sneed, Palmer, Nicklaus, Player, Floyd, Casper, Nelson, Seve, Watson, Tiger, Phil, etc. It is unbelievable how good these guys are. I remember watching on the practice range as Tiger would land 300 yard shots within a few feet of each other at will. The commercial that says, “These guys are good,” is so understated. You realize this when you play the game of golf and then watch great players play the game of golf. It is a VERY hard game to be great at. 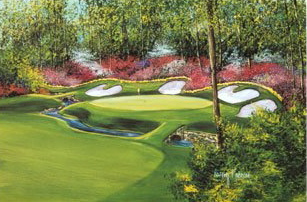 Amen Corner – This 3 hole stretch is tucked away on the far side of the course. #11 – a very difficult par 4 fronted by a pond, #12 – one of the most famous holes in golf with a tight little postage stamp green (fronted by Rae’s Creek) where many a tournament has been lost, and #13 – one of the greatest risk/reward holes in the game of golf. This little patch of property also serves as a metaphor for my life – which I may tell you about some time. A chance to play! 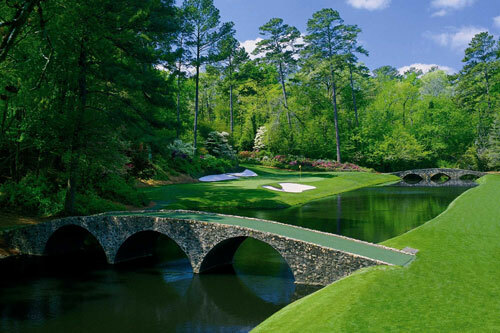 – Okay, no not really, I haven’t had a chance to play Augusta National – but it is on my bucket list – so if any one reading this has a connection and wants to make one of my dreams come true then you have my blessings to try. 7 “Then the one inside answers, ‘Don’t bother me. The door is already locked, and my children are with me in bed. I can’t get up and give you anything.’ 8 I tell you, though he will not get up and give him the bread because he is his friend, yet because of the man’s boldness he will get up and give him as much as he needs. 9 “So I say to you: Ask and it will be given to you; seek and you will find; knock and the door will be opened to you. 10 For everyone who asks receives; he who seeks finds; and to him who knocks, the door will be opened. I’m going to make a couple of brief comments about this passage and then give you some supplementary things to chew on about prayer. First, this passage tells us more about the nature of God than it does about how to pray. The one thing that I see more than anything is the fact that God is Father! It makes me sad that so many people do not understand how incredible it is to be able to call upon our Heavenly Father because they have such a messed up picture of what a real father is in their personal lives. This has been very true for me. I grew up without a dad’s influence in my life. My folks were divorced when I was six, we then moved 60 miles away, and then he died when I was 13. So my dad was never really present in my life. I think this accounts for why prayer for me has always been hard and why I have never felt enjoyed a deep, satisfying, intimate prayer life. It is something I have to work at – when it should be one of the pure joys of my life… hanging out in the presence of my Heavenly DAD. Second, the one thing I do get from this passage about how to pray is to pray boldly. Don’t be afraid to ask God for what you want. And to keep on asking Him until He answers. James says in his epistle, “You do not have because you do not ask…” So ask! The worse He can say is NO. But He just might say YES. Just always remember that He is your DAD. He wants what is for your good and for His glory. He doesn’t want spoiled children but He does want you to delight in Him and to enjoy the freedom to ask Him for anything. He is wise enough to know if what you are asking for should be given. Through the years I’ve found some quotes about prayer that I really like – so I want to share a few of these with you as well. They are also worth spending some pondering time on. Take some time this week to enjoy some quality time with your DAD. It may be the best thing that you can do for you and your family.